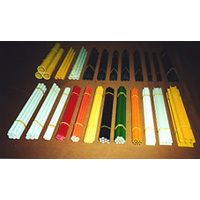 Goodwill FRP Rod, Tube are made by pultrution machine by material of glassfiber / carbonfiber roving with resin of polyester / vinylester. FRP Sheet are made by press machine by fiberglass cloth with epoxy resin. Solid Rod (dia. mm): 1.8, 2.1, 2.5, 2.8, 3.5, 4.0, 4.5, 5.0, 6.0, 6.4, up to 12.0, 14.0, 22.0, 25.0. and so on. Color: white, black, red, orange, yellow or as request.